Award winning trial attorney, professor, family man, triathlete, and avid cyclist for philanthropic causes, Craig Needham strives each day to maintain a balanced life. After 45 professional years, no dreaded “burn out” for him, as he quickly dismisses any thought of the “R” word. On May 24th we will hear how he successfully does it, but that is not all. When Craig Needham was three years old, his mother contracted polio and was in an iron lung. Craig was born in Palo Alto, graduated from Bellarmine Prep, Santa Clara University and Hastings College of the Law. After serving in the military, he began a career as a plaintiff’s trial attorney and today leads Needham Kepner & Fish LLP in San Jose. He has been named Trial Lawyer of the Year and Mediator of the Year and has been active in, and often led, trial lawyers associations on the local, state and national levels. 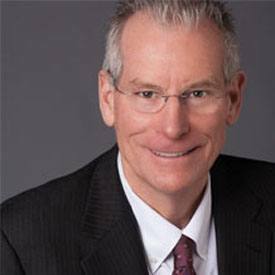 Craig has also been a faculty member at Hastings, Pepperdine, Santa Clara and Lincoln Law Schools, and a lecturer for continuing education programs all around the state. Craig and his wife, Stephanie, have three children and six grandchildren. In his leisure time, Needham has taken endurance to another level: a 4,200 mile ride across North America, a trek through the French and Italian Alps, and a 2,500 mile ride from El Paso, Texas to Jasper, Alberta, Canada (think Rocky Mountains), raising money in each for the Children’s Skin Disease Foundation. A cancer survivor, he has also raised money for the Leukemia and Lymphoma Society of America and AIDS research. Again, that’s not all. Craig has completed 12 marathons and over 40 triathlons, six of which have been “iron-man.” He has not missed a Bay to Breakers since 1970.